Prepare yourself for a tour like no other! What you will experience is by far the most enjoyable and authentic way to view the island. Keep in mind there are no set departure times. You will be on the next available carriage once you have purchased your ticket at the ticket office. Reservations are not accepted for the regular public tour. 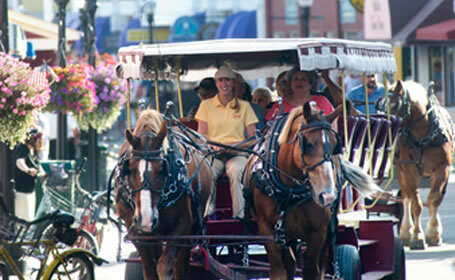 Our horse-drawn taxi cabs are radio dispatched and available 24 hours per day during the summer season. Taxi cabs cannot be "hailed" on Mackinac Island, rather, you must call the taxi dispatch office to request taxi service. 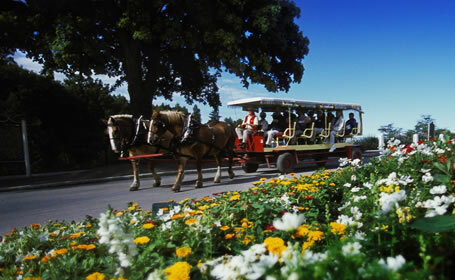 A Mackinac Island wedding isn't complete without the carriage. 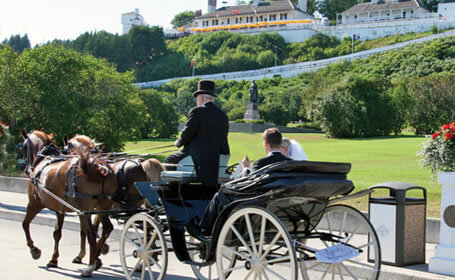 Whether your wedding plans include an historic Mackinac church or a breathtaking garden, an antique carriage from Mackinac Island Carriage Tours is the crowning touch to your special day.